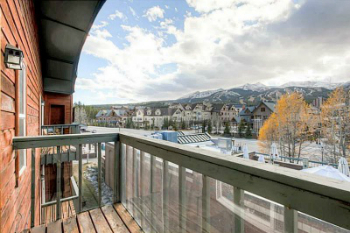 Located on the south end of Ridge Street in Breckenridge, this small Panorama Alpine condos for sale are convenient – less than a block from Main Street. Built near the top of the ridge that is Ridge Street, these condos have a vantage point over many of the Main Street buildings. And their entrance on Ridge Street makes coming and going quieter and the off-street parking easier. Short term, or long-term, rental income is possible due to the excellent in-town location of Panorama Alpine. It’s steps from LaCima Mall and just a block from the post office. Ski shuttle stops are close or you can walk to the lifts at the Peak 9. Read more about the style and convenience of these residences, or check out the available Panorama Alpine condominium listings found below! Panorama Alpine condos are small and efficient with full length windows facing the west and the Ten Mile Range. Afternoon sun stays long on the decks of these studio and one bedroom condos. Thanks to forward-thinking vision by the Breckenridge Open Space and Trails Commission, there are trails radiating from the center of Breckenridge in all directions and make it unnecessary to drive to a trailhead to begin a ride or hike. A free shuttle stops a block away and transports skiers in the winter to any of the peaks of the Breckenridge Ski Resort or the transportation center to connect to the free countywide – Summit Stage. Size: 463 sq. ft to 609 sq. ft. Amenities: a stone's throw from Main Street, but not on it. Small building, nice views, near shuttle route. 505 S. Ridge: Panorama Alpine is located south of Jefferson on Ridge Street. Drive south on Main or Ridge Street and you’ll find Panorama Alpine in the block south of the post office, north of the Breckenridge Brewery. Are you excited to find the condo for sale of your dreams? Contact Breckenridge Associates today to get your journey started!